Blastin' Fools Records Tower in Market, Los Santos, Grand Theft Auto: San Andreas. Blastin' Fools Records, also known simply as Blastin' Fools, is record label and store featured in Grand Theft Auto: San Andreas. 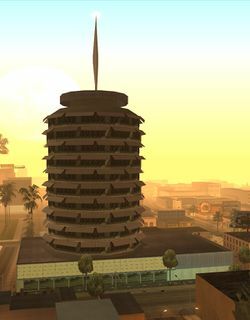 Based in a modernist cylindrical tower located in Market, Los Santos, Blastin' Fools Records was founded by Jimmy Silverman, who serves as the producer and manager of the company as of events in GTA San Andreas circa 1992. Blastin' Fools Records is a play on Capitol Records; the building itself is a partial recreation of the Capitol Records Building in Hollywood, Los Angeles. Blastin' Fools Records is most prominently associated with two major characters in GTA San Andreas. Since the beginning of the game's storyline, Madd Dogg has long signed to the label, but was close to spiraling into oblivion as a result of several setbacks instigated by OG Loc and his subsequent depression; OG Loc took advantage of the void left over by Madd Dogg and signed in on the label himself. After being saved from suicide by Carl Johnson and rehabilitated, Madd Dogg eventually pursues OG Loc upon learning OG Loc was responsible for Madd Dogg's downfall. After a lengthy chase that leads to Blastin' Fools Records, Silverman learns of OG Loc's lack of talent and threatens to sue OG Loc; OG Loc may have been dropped from the label as a result. As indicated from Forgotten Legends of West Coast Rap, the label has released a series of albums over the course of the early 1990s, well into 1993 (the label for Rochell'le's Dangerous Curves (1994) is unspecified), one years after events in GTA San Andreas. It is unknown if Blastin' Fools Records has release albums before or after the early 1990s. The interior of Blastin' Fools is briefly featured during the closing cutscene of "Cut Throat Business", consisting of nothing more than a hallway-like room, with a corner sofa, decors and hung golden records. As is with interiors accessible only during cutscenes, the interior can only be visited in the Hidden Interiors Universe. Badger Building: the HD Universe rendition of the Blastin' Fools Record Building. This page was last modified on 18 September 2013, at 04:21.